Please contact the leader if you are thinking of coming to an event (except those marked *). It will help us to communicate changes to events if we have your email address. Please email your name to using your normal email address. This can then be added to our membership list. Friday 19th – Tuesday 23rd April - Butterfly Conservation nectar plant display. A coordinated Suffolk Butterfly Conservation and Marlow’s garden centre display featuring a collection of their available pollen and nectar rich plants. Butterfly identification and recording at Martlesham Creek and farmland nearby. Beginners very welcome. Join Suffolk Branch of Butterfly Conservation and lots of other conservation groups at Kiln Meadow. Butterfly and other guided walks, wood crafts, children’s activities, music and storytelling. Park at Bourne Park off Stoke Park Drive and take free minibus to the event on Kiln Meadow. A series of surveys and walks to ascertain the population and locations of Dingy Skipper in Suffolk. Location: Various events will be run but will include key sites within Kings Forest and other locations in Breckland Suffolk. Events will, as always, be dependant on weather to coincide with the peak flight period in 2019. Butterflies of the wildflower meadows (40 acres) and SSSI woodland (80 acres) of West Hall Farm, Rickinghall. Butterfly identification and recording along the Aldeburgh to Snape Sailors' Path. Beginners very welcome. Time: 10.30am - 2.00pm (with optional afternoon visit to SWT Hazelwood Marshes) Linear morning walk, lift back to start point will be available. Come and find Suffolk Branch in the Conservation Zone at Plant Heritage (Suffolk Group's) Spring Fair at Helmingham Hall Gardens. £7 entrance fee per person. All children under 16 years free. A search along the Stour Valley path for summer species. Time: 10am start until about 2pm. Meet: Provisional meeting point is Walpole green in village centre, but contact Peter Maddison to confirm details. Saturday 29th June - Landseer Park Summer Butterfly walk. Meet: Landseer Park car park. Meet; at the first car parking area towards the end of the road starting at the Green in Tuddenham village. The track is very bumpy after this point. Join Rob Parker and Jillian Macready at Wyken. The estate comprises 5 woods some of which are SSSI with recently seen White Admirals and Silver washed Fritillary. Start off your butterfly count in style. Meet at Wyken Vineyard a short walk south of The Leaping Hare (IP31 2DW) we will walk through one or two of the woods on this private estate. Meet:- July Racecourse entrance near A1303/A1304 roundabout with horse statue. With over 20 species recorded on this SSSI, it is a good place to see butterflies even on a damp day. Suitable for families and novices, the range of species and their numbers will make it a good walk for those of experience. It is somewhere different. Where - Off the A11 north-east of Newmarket. Start time - 13.00 hrs. (1.00 pm); 3 hours max. An invitation from BC member Mrs Trudie Willis, to visit her 10 acre garden, including a Buddleia and Honeysuckle collection. The Wall has had a massive decline in population in the UK and has nearly disappeared from Suffolk. Carlton Marshes is the last place where you can hope to see the butterfly. Peter Eeles will be the guest speaker. Peter runs the UK Butterflies website (www.ukbutterflies.co.uk). In 2016 he was presented with the Marsh Award for the Promotion of Lepidoptera Conservation at Butterfly Conservation's AGM. 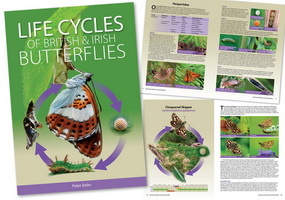 He is writing "Lifecycles of British and Irish Butterflies" to be published in October 2019. Please note the change in location and the afternoon start. The AGM will be followed by the guest speaker, members' slides, light refreshments and the annual photo competition. Further details will be announced in The Suffolk Argus and on the Branch website. • Wear appropriate footwear. If there are unusual requirements these will be noted in the event programme, but stout shoes are a minimum requirement for any walk. • The leader will brief you on the trip before setting off, with details of any known hazards and advice on what to do in an emergency – please listen carefully. • By their nature, butterflies are not always to be found next to the path and will offer many opportunities (temptations) to wander off the track. It’s easy to be distracted and to miss potential hazards such as rabbit holes, fallen or hanging branches, barbed wire etc. Beware of wet grass or moss, particularly on sloping ground. Children are welcome at branch events but, if under 16, they must be accompanied by a responsible adult (maximum of two children per adult). If you are bringing children with you, please ensure that the event is within their capability. • Dogs may be allowed at some of the events. Please contact the leader in advance to find out if the event is suitable. • If you are uncertain about any aspect of an event or activity, please contact the leader in advance. Contact details can be found with each event entry. Do let the leader know if you need, or can offer, a lift. If you decide to leave early, please tell the event leader. Please note that persons who take part in these events do so entirely at their own risk and The Suffolk Branch of Butterfly Conservation cannot accept liability for any injuries or losses during the course of an event. Binoculars, cameras, field guides and notebooks are always useful. For moth nights bring a torch and eye protection (i.e. polarised sunglasses or wide-brimmed hat). Remember, most nature reserves do not permit dogs. Map references are based on the Ordnance Survey 1:50,000 Landranger series and are approximate. They refer to the rendezvous, not the site. Anyone is welcome to come along, Branch members or not. At the 2019 AGM there will be a photo competition for photos taken in the UK or abroad by a member of SBBC. Early Stage Butterfly or Moth (Ovum, Larva, Pupa) – it is hoped this category will encourage you to search for and photograph the developmental journey to adulthood. A maximum of five entries per person. Such entries can be spread across more than one category (e.g. 2 in two categories and one in another). Maximum size for photographs is 12" x 8". There is no video category. All photographs must be taken during 2018. The winning entries for each category will be published in a future edition of the 'Argus'. There will be a prize for the overall photograph that gains the most votes. In the event of a tie, the competition organiser shall have the casting vote. Whilst every care is taken with entries, the BC Suffolk Committee cannot be held responsible for any damage or loss of photographs. Enjoy your Summer of Butterflies and we look forward to seeing your photographs at our AGM.